Michael Charles of Amco said.”Three quarters of UK Motorists research the price of Tyres Online but only 8% have purchased from the channel. In Germany almost 15% buy online so significant growth is likely in the near future”. Martin T Coyne & Matt D Hardy of Birmingham based Poppleton & Appleby have been appointed as joint administrators of Tyretraders.com Ltd.
Tyretraders operated a well established E-commerce Tyre Sales site with audited sales of £3.7m in 2014. The unaudited management accounts for 2015 suggest a similar performance. 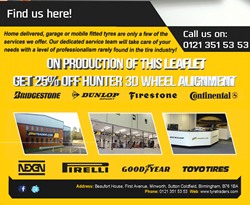 Between 2008 & 2012 Tyretraders.com ltd invested £297k, when in conjunction with Wolverhampton University, it embarked on the development of a bespoke E-commerce platform to manage its sales and operations. The Tyretraders.com ltd website receives significant traffic averaging circa 10,000 visits per week over the last 12 months. Around 50% of that traffic results in return visits. Tyretraders operating base is a modern Distribution Unit in First Avenue Sutton Coldfield which doubles as a fitting centre with a total gross internal area of some 20,000 sq ft. There are considerable resources at the site including Offices, Fitting and Tracking Bays. There is also extensive racked storage space and Gated Hard Standing. The retail customer experience is well catered in the reception area with TV and CCTV Monitors allowing the clients to see the progress of work on their vehicles. There is a whole floor of office space available for further expansion. Michael Charles of London based Amco-Agency and Rajiv Kumar of Birmingham based Kumar & Company Limited have been instructed to deal with expressions of interest in the Business and/or the Assets.